2005-08-03 Assigned to ALLERGAN, INC. reassignment ALLERGAN, INC. ASSIGNMENT OF ASSIGNORS INTEREST (SEE DOCUMENT FOR DETAILS). 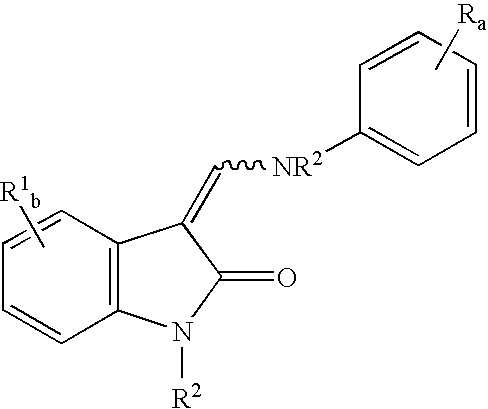 Assignors: BOIX, MICHELE, ROSSI, ELISABETH, SARRAZIN, CHRISTIAN, HUGHES, PATRICK M.
Biocompatible intraocular microspheres include a tyrosine kinase inhibitor and a biodegradable polymer that is effective to facilitate release of the tyrosine kinase inhibitor into the vitreous of an eye for an extended period of time. The therapeutic agents of the microspheres can be associated with a biodegradable polymer matrix, such as a matrix that is substantially free of a polyvinyl alcohol. The microspheres can be placed into an eye to treat or reduce the occurrence of one or more ocular conditions. This application is a continuation in part of application Ser. No. 10/837,361 filed Apr. 30, 2004, the entire content of which is incorporated herein by reference. The following terms as defined as follows, unless the context of the word indicates a different meaning. As used herein, an “intraocular implant” refers to a device or element that is structured, sized, or otherwise configured to be placed in an eye. Intraocular implants are generally biocompatible with physiological conditions of an eye and do not cause adverse side effects. Intraocular implants may be placed in an eye without disrupting vision of the eye. The term “implant” includes “microimplant” or synonymously, “microsphere”. “Microimplants” or “microspheres” refers to implants having a sufficiently small cross-sectional area that they can be delivered according to methods that result in self-sealing of the eye at the puncture site associated with the delivery. In particular, such microimplants have dimensions such that they are deliverable through 20 gauge, 21 gauge or 22 gauge or smaller sized cannulas. Thin wall versions of 21 gauge needles can be manufactured having inner diameters of up to 0.028 inches, thus cylindrical microimplants deliverable through such cannulas will have outer diameters of less than 0.028 inches. Microimplants can also have non-circular cross-sectional geometries for delivery through cannulas having corresponding cross-sectional geometries. Where the micro-implant has non-circular cross-section, the cross-sectional area may be up to 0.00025 square inches or more, depending on the particular cross-sectional geometry. Implants, including microimplants, may be understood to comprise relatively smaller units of one or more active ingredients. For example, an implant may comprise a population of particles of an active ingredient. As used herein, particles may have any shape and are smaller in size than an implant that is administered to a patient to treat an ocular condition. In contrast to liquid ophthalmic compositions, the present implants are substantially solid, at least initially, before administration to a patient in need of ocular therapy. Microimplants within the scope of the present invention include those set forth in U.S. patent application Ser. No. 11/070,158, filed Mar. 1, 2005. An “anterior ocular condition” is a disease, ailment or condition which affects or which involves an anterior (i.e. front of the eye) ocular region or site, such as a periocular muscle, an eye lid or an eye ball tissue or fluid which is located anterior to the posterior wall of the lens capsule or ciliary muscles. Thus, an anterior ocular condition primarily affects or involves the conjunctiva, the cornea, the anterior chamber, the iris, the posterior chamber (behind the retina but in front of the posterior wall of the lens capsule), the lens or the lens capsule and blood vessels and nerve which vascularize or innervate an anterior ocular region or site. A “posterior ocular condition” is a disease, ailment or condition which primarily affects or involves a posterior ocular region or site such as choroid or sclera (in a position posterior to a plane through the posterior wall of the lens capsule), vitreous, vitreous chamber, retina, optic nerve (i.e. the optic disc), and blood vessels and nerves which vascularize or innervate a posterior ocular region or site. Intraocular implants in accordance with the disclosure herein comprise a therapeutic component and a drug release sustaining component associated with the therapeutic component. The implants may be solid, semisolid, or viscoelastic. 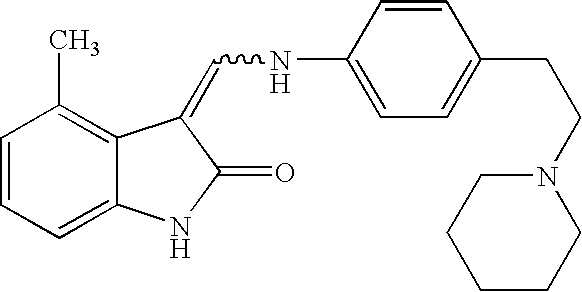 In accordance with the present invention, the therapeutic component comprises, consists essentially of, or consists of, a tyrosine kinase inhibitor (TKI), for example, an agent or compound that inhibits or reduces the activity of tyrosine kinase. The TKI may also be understood to be a small molecule TKI. The drug release sustaining component is associated with the therapeutic component to sustain release of an amount of the TKI into an eye in which the implant is placed. TKIs may be released from the implant by diffusion, erosion, dissolution or osmosis. The drug release sustaining component may comprise one or more biodegradable polymers or one or more non-biodegradable polymers. Examples of biodegradable polymers of the present implants may include poly-lactide-co-glycolide (PLGA and PLA), polyesters, poly (ortho ester), poly(phosphazine), poly(phosphate ester), polycaprolactone, natural polymers such as gelatin or collagen, or polymeric blends. The amount of the TKI is released into the eye for a period of time greater than about one week after the implant is placed in the eye and is effective in reducing or treating an ocular condition. A method of making the present implants involves combining or mixing the TKI with a biodegradable polymer or polymers. The mixture may then be extruded or compressed to form a single composition. The single composition may then be processed to form individual implants suitable for placement in an eye of a patient. Our invention also includes a biodegradable intravitreal implant comprising: a plurality of biodegradable polymer microspheres encapsulating a tyrosine kinase inhibitor (TKI), the microspheres releasing the TKI at a rate effective to sustain release of the TKI from the microspheres for at least about one week after the implant is placed in the vitreous of an eye. 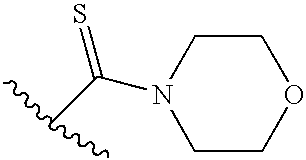 The polymer can be a polylactide, poly(lactide-co-glycolide), polycaprolactone, or a derivative thereof, or a mixture thereof. By encapsulating it is meant that the active agent is associated with, dispersed within, mixed with and/or embedded in the polymer. The microspheres of this biodegradable intravitreal implant can release the TKI at a rate effective to sustain release of an amount of the TKI from the implant for more than one month from the time the implant is placed in the vitreous of the eye. The TKI can be present in the implant (i.e. the plurality of microspheres) in an amount of from about 40% by weight to about 60% by weight of the implant, and the biodegradable polymer matrix can comprise a poly(lactide-co-glycolide) in an amount from about 40% by weight to about 60% by weight of the implant. (g) evaporating the solvent, thereby making biodegradable active agent microspheres. The organic phase can be a viscous fluid. This method can also have the step of crystallizing active agent in the organic phase and/or the further step of crystallizing active agent in the emulsion. Preferably, the pH of the first aqueous phase is between about pH 6 and about pH 8 and the pH of the second aqueous phase is between about pH 4 and about pH 9. (i) evaporating the solvent, thereby making biodegradable active agent microspheres. The active agent can be a TKI. Finally, our invention also encompasses a method for treating an ocular condition of an eye of a patient by placing biodegradable intraocular microspheres into the vitreous of an eye of the patient, the microspheres comprising a TKI and a biodegradable polymer, wherein the microspheres degrades at a rate effective to sustain release of an amount of the TKI from the microspheres effective to treat the ocular condition. The ocular condition can be, for example, a retinal ocular, glaucoma or a proliferative vitreoretinopathy. FIG. 16 is a graph of the cumulative release profile for three different formulations of TKI (AGN206639) containing implants in phosphate buffered saline release medium, pH 7.4. FIG. 17 is a graph of the cumulative release profile for five further and different formulations of TKI (AGN206639) containing implants in phosphate buffered saline release medium, pH 7.4. FIG. 18 is a graph of the cumulative release profile for three different formulations of TKI (AGN205558) containing implants in phosphate buffered saline release medium, pH 7.4. FIG. 19 is a graph of the cumulative release profile for eight different formulations of TKI (AGN206320) containing implants in phosphate buffered saline release medium, pH 7.4. FIG. 20 is a graph of the cumulative release profile for eight different formulations of TKI (AGN206784) containing implants in phosphate buffered saline release medium, pH 7.4. FIG. 21 is a graph of the cumulative release profile for seven different formulations of TKI (AGN206316) containing implants in phosphate buffered saline release medium, pH 7.4. FIG. 22 is a summary flow chart of a known process for making active agent microspheres. FIG. 23 is a summary flow chart of a new process for making active agent microspheres. FIG. 24 shows the chemical structures of five TKIs used as the active agents in biodegradable microspheres. FIG. 25 is a graph of the cumulative in vitro % total TKI release profiles of five different TKI PLGA microimplant formulations in phosphate buffered saline release medium, pH 7.4, over a 28 day period. Microimplants prepared according to the present invention can be sufficiently small, or miniaturized, in size and shape such that they can be inserted into the eye without the necessity of an incision or puncture wound made in the eye that would normally require suturing or other surgical procedure to repair, as is typically the case when implanting larger implants. With the present microimplants, and according to insertion techniques further described below, the eye can “self-seal” after insertion of the microimplant, thereby eliminating the need for suturing or surgery, and the pain and trauma associated therewith, and also avoiding the costs, time and other inconveniences of performing such procedures in a surgical setting. As used herein, “self-sealing” methods of delivering microimplants into the eye refers to methods of introducing one or more microimplants through a cannula and into desired locations of a patient's eye without the need for a suture, or other like closure means, at the cannula puncture site. Such “self-sealing” methods do not require that the puncture site completely seal immediately upon withdrawal of the cannula, but rather that any initial leakage is minimal and dissipates in short order such that a surgeon or another person skilled in the art, in his or her good clinical judgment, would not be compelled to suture or otherwise provide other like closure means to the puncture site. Both larger implants and smaller microimplants produced according to the present invention will have highly uniform characteristics and thus retain the ability to deliver precise and accurate dosage of the active ingredient, thereby providing for a highly controlled rate of release of the active ingredient into the eye over a specified time. The active ingredient released from the present implants may selectively target certain regions of the eye. For example, for implants placed in the posterior segment of an eye of a patient, the active ingredient may be released from the implant so that the active ingredient provides a therapeutic benefit to the retina, or a portion of the retina of the eye in which the implant is placed. The present implants can be produced by combining particles of an active ingredient or ingredients and particles of a bioerodible polymer or polymers. According to particular processes, microimplants can be produced through a manufacturing process that includes sorting particles made of an active ingredient or ingredients and particles made of a bioerodible polymer or polymers according to size, blending these particles into a homogenous mixture of active ingredient(s) and bioerodible polymer(s), extruding (using a single or dual extrusion method) this mixture into filaments, precisely cutting these filaments into microimplants, and inspecting these microimplants for desired characteristics. This manufacturing process can be used to produce batches or populations of microimplants having the desired uniform characteristics, such as weight, dimensions (e.g., length, diameter, area, volume), regional distribution of active ingredients, release kinetics, and the like. For instance, these batches can be subjected to a specified acceptance criteria, including, e.g., a specified mass criteria, such as within a certain weight percentage of the desired target weight per microimplant, or e.g., a specified acceptable mass standard deviation for the microimplants of each batch. A specific drug/polymer ratio can also be obtained so that each individual implant of a batch or population of implants can contain the same amount of active ingredient. Thus, a batch of implants, such as a batch of implants in a package, may be provided with a specific label strength or dose of active ingredient for each individual implant of that batch. Generally, implants and microimplants produced according to the invention can be formulated with a mixture of an active ingredient or ingredients and a bioerodible polymer or polymers, which can together control the release kinetics of the active ingredient into the eye. The particular formulations may vary according to the preferred drug release profile, the particular active ingredient or ingredients being used, the site of implantation, the condition being treated, and the medical history of the patient, for example. The present implants are formulated with particles of the active ingredient entrapped within the bioerodible polymer matrix. Release of the active ingredient or ingredients is achieved by erosion of the polymer followed by exposure of previously entrapped or dispersed active ingredient particles to the eye, and subsequent dissolution and release of agent. The parameters which determine the release kinetics include, but are not limited to, the size of the drug particles, the water solubility of the drug, the ratio of drug to polymer, the particular methods of manufacture, the shape of the implant, the surface area exposed, and the erosion rate of the polymer. The TKI of the implant is typically an agent that inhibits or reduces the activity of a tyrosine kinase. The TKI may inhibit tyrosine kinase activity by directly acting on a tyrosine kinase molecule, or it may cooperate with one or more other factors or agents to achieve the desired inhibition. Examples of TKIs useful in the present implants are described in U.S. Patent App Nos. 10/256,879 (U.S. Pub. No. 20030199478) and 10/259,703 (U.S. Pub. No. 20030225152). Preferably, R is selected from the group consisting of CH3, CH2CH3, OCH3, OH, t-butyl, F, CN, C(O)NH2, HNC(O)CH3, CH2C(O)OH, SO2NH2, C(O)OH, OCF2H, isopropyl, C2H5OH, C(O)OCH3, CH2OH, NH—CH═CH, HC═N—N—H, N═CH—S, O(CR7R8)dR6, (CR7R8)cR6 and —NR2(CR7R8)dR6, wherein R6 is selected from the group consisting of 3-fluoropyrrolidinyl, 3-fluoropiperidinyl, 2-pyridinyl, 3-pyridinyl, 4-pyridinyl, 3-pyrrolinyl, pyrrolidinyl, methyl isonipecotate, N-(2-methoxyethyl)-N-methylamyl, 1,2,3,6-tetrahydropyridinyl, morpholinyl, hexamethyleneiminyl, piperazinyl-2-one, piperazinyl, N-(2-methoxyethyl)ethylaminyl, thiomorpholinyl, heptamethyleneiminyl, 1-piperazinylcarboxaldehyde, 2,3,6,7-tetrahydro-(1H)-1,4-diazepinyl-5 (4H)-one, N-methylhomopiperazinyl, (3-dimethylamino)pyrrolidinyl, N-(2-methoxyethyl)-N-propylaminyl, isoindolinyl, nipecotamidinyl, isonipecotamidinyl, 1-acetylpiperazinyl, 3-acetamidopyrrolidinyl, trans-decahydroisoquinolinyl, cis-decahydroisoquinolinyl, N-acetylhomopiperazinyl, 3-(diethylamino)pyrrolidinyl, 1,4-dioxa-8-azaspiro[4.5]decaninyl, 1-(2-methoxyethyl)-piperazinyl, 2-pyrrolidin-3-ylpyridinyl, 4-pyrrolidin-3-ylpyridinyl, 3-(methylsulfonyl)pyrrolidinyl, 3-picolylmethylaminyl, 2-(2-methylaminoethyl)pyridinyl, 1-(2-pyrimidyl)-piperazinyl, 1-(2-pyrazinyl)-piperazinyl, 2-methylaminomethyl-1,3-dioxolane, 2-(N-methyl-2-aminoethyl)-1,3-dioxolane, 3-(N-acetyl-N-methylamino)pyrrolidinyl, 2-methoxyethylaminyl, tetrahydrofurfurylaminyl, 4-aminotetrahydropyran, 2-amino-1-methoxybutane, 2-methoxyisopropylaminyl, 1-(3-aminopropyl)imidazole, histamyl, N,N-diisopropylethylenediaminyl, 1-benzyl-3-aminopyrrolidyl 2-(aminomethyl)-5-methylpyrazinyl, 2,2-dimethyl-1,3-dioxolane-4-methanaminyl, (R)-3-amino-1-N-BOC-pyrrolidinyl, 4-amino-1,2,2,6,6-pentamethylpiperidinyl, 4-aminomethyltetrahydropyranyl, ethanolamine and alkyl-substituted derivatives thereof, e.g. 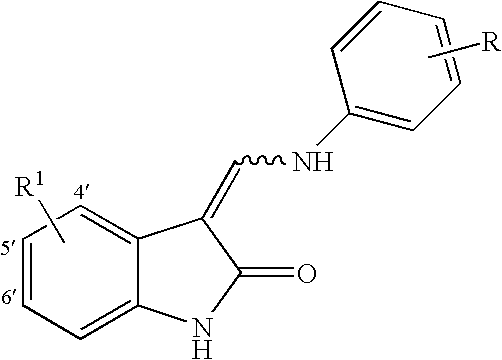 R6 is morpholinyl or CH2N(CH3)2. More preferably, R is selected from the group consisting of m-ethyl, p-methoxy, p-hydroxy, m-hydroxy, p-cyano, m-C(O)NH2, p-HNC(O)CH3, p-CH2C(O)OH, p-SO2NH2, p-CH2OH, m-methoxy, p-CH2CH2OH, HNCH═CH, HC═N—NH, p-morpholinyl, N═CH—S, p-OCHF2, p-COOH, p-CH3, p-OCH3, m-F, m-CH2N(C2H3)2, (CR7R8)cR6, O(CR7R8)dR6 and NR2(CR7R8)dR6. One example of the biodegradable intraocular implant comprises a TKI with a biodegradable polymer matrix that comprises a poly(lactide-co-glycolide) or a poly(D,L-lactide-co-glycolide). The implant may have an amount of the TKI from about 20% to about 60% by weight of the implant. Such a mixture is effective in sustaining release of a therapeutically effective amount of the TKI for a time period from about one month to about six months from the time the implant is placed in an eye. Examples of antibiotics include without limitation, cefazolin, cephradine, cefaclor, cephapirin, ceftizoxime, cefoperazone, cefotetan, cefutoxime, cefotaxime, cefadroxil, ceftazidime, cephalexin, cephalothin, cefamandole, cefoxitin, cefonicid, ceforamide, ceftriaxone, cefadroxil, cephradine, cefuroxime, cyclosporine, ampicillin, amoxicillin, cyclacillin, ampicillin, penicillin G, penicillin V potassium, piperacillin, oxacillin, bacampicillin, cloxacillin, ticarcillin, aziocillin, carbenicillin, methicillin, nafcillin, erythromycin, tetracycline, doxycycline, minocycline, aztreonam, chloramphenicol, ciprofloxacin hydrochloride, clindamycin, metronidazole, gentamicin, lincomycin, tobramycin, vancomycin, polymyxin B sulfate, colistimethate, colistin, azithromycin, augmentin, sulfamethoxazole, trimethoprim, gatifloxacin, ofloxacin, and derivatives thereof. The present implants are configured to release an amount of the TKI(s) effective to treat or reduce a symptom of an ocular condition, such as a posterior ocular condition. The ocular pharmacokinetics of AGN 199659, AGN 200954, AGN 201088 and AGN 201666 following single intravitreal injections into female albino rabbit eyes was determined. The animals were dosed with a 50 μL intravitreal injection of 242 ng AGN 201088, 128 ng AGN 201666, 114 ng AGN 199659 or 222 ng of AGN 200954 per eye. Vitreous humor samples (n=4 eyes per timepoint) were collected at 0.5, 1, 2, 4, 8, and 12 hr postdose. The TKI concentration in the vitreous humor was determined using a liquid chromatography tandem mass spectrometry method (LC-MS/MS). 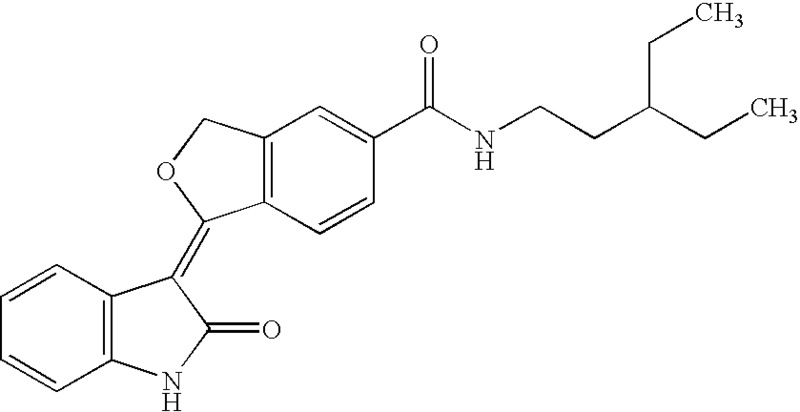 AGN 201634 was obtained from Allergan, and its chemical structure is shown below. It was used as received without further purification. PDLG/PDL polymer materials were obtained from Purac America Inc.
media under various incubation conditions. TKI releases of Formulations 3 and 4 in 10 mL media of a pH of 6.0 (with 0.1% CTAB), 7.4 (PBS) or 8.5 (with 0.5% SDS) at 37° C. are demonstrated in FIGS. 12 and 13, respectively. For F3, more than 50%, 45%, and 75% TKI was released at the first 3, 7, and 2 weeks, when DDS was incubated in a medium of pH 6.0 (with 0.1% CTAB), 7.4 (PBS) and 8.5 (with 0.5% SDS), respectively. On the other hand, approximately 47%, 6%, and 68% of TKI was released from F4 when DDS was incubated in media as described above. It seems that TKI release in different pH medium is pH 8.5>pH 6.0>pH 7.4, with or without the assistant from detergent in the medium. No large standard deviations are found in all media for both formulations. In summary, tyrosine kinase inhibitor (AGN 201634) DDS were formulated using various PLGA or PLA at various drug loading. The stability of AGN 201634 solution in DI water/acetonitrile (75%/25%) at 4° C. was more than 35 days, and DDS solution in various pH medium was more than 7 days under ambient condition or 14 days at 4° C. Different drug release profiles were found when DDS was tested in PBS or saline. Drug burst effect was found only in Formulation 3 when incubating in a medium of pH 6.0. Controlled AGN 201634 release in vitro was more than 4 weeks in a medium of pH 8.5, and more than 5 months in media of pH 7.4 and pH 6.0. Drug assays may be performed by HPLC, which consists of a Waters 2690 Separation Module (or 2696), and a Waters 2996 Photodiode Array Detector. An Ultrasphere, C-18 (2), 5 μg/m; 4.6×150 mm column heated at 30° C. can be used for separation and the detector can be set at 264 nm. The mobile phase can be (10:90) MeOH-buffered mobile phase with a flow rate of 1 mL/min and a total run time of 12 min per sample. The buffered mobile phase may comprise (68:0.75:0.25:31) 13 mM 1-Heptane Sulfonic Acid, sodium salt-glacial acetic acid-triethylamine-Methanol. The release rates can be determined by calculating the amount of drug being released in a given volume of medium over time in μg/day. TKIs can inhibit tyrosine kinase of vascular endothelial growth factor (VEGF). VEGF can induce angiogenesis and increases vascular permeability. Thus, TKIs can have utility to prevent or to treat choroidal neovascularization (CNV), such as CNV that can results from or be a symptom of, for example, age-related macular degeneration (AMD) and diabetic retinopathy (DRO). In this experiment implants containing one of five different TKIs (receptor-mediated tyrosine kinase inhibitors) with antiangiogenic activity were made and evaluated. The implants were formulated as TKI, sustained release, biodegradable polymer implants with different poly(D,L-lactide-co-glycolide) and poly(D-L-lactide) polymers, made by a melt extrusion process. These implants are suitable for intraocular (such as intravitreal) use to treat one or more ocular disorders. Specifically, we made and evaluated controlled release intravitreal implants for the TKIs AGN206639, AGN205558, AGN206320, AGN206784, and AGN206316, showing that such implants can consistently release a TKI over a period of from about three to about six months. The implant formulations were evaluated in vitro in two different release media (phosphate buffered saline and citrate phosphate buffer with 0.1% cetyltrimethylammonium bromide). The effect of elevated temperature storage and of gamma sterilization on potency were also examined. Although the implants were made by melt extrusion with poly(lactide) or poly (lactide-co-glycolide) polymers various implant formulations were made with or under different drug (TKI) load, lactide-glycolide ratio, intrinsic viscosity, and extrusion temperature. The polymer implant drug delivery systems (DDSs) made were assayed by HPLC for potency initially, post-sterilization, and after exposure to accelerated conditions. The TKI release from the DDS was assayed by HPLC after incubation in two different release media at 37° C.: (1) phosphate buffered saline (pH 7.4), and; (2) citrate phosphate buffer with 0.1% cetyltrimethylammonium bromide (pH 5.4). Generally, release rates were higher for similar polymer systems with higher drug (TKI) loading. Table 11 sets forth the five different TKIs formulated into drug delivery systems (i.e. implants). 1 ml/min. for 10 min. 1 ml/min. for 10 min. Acetic acid w/5 mM HAS; 1 ml/min. for 10 min. 1 ml/min. for 10 min. Purasorb PDL, Poly(D,L-lactide), Purac Corp. lot #DG676GA (inherent viscosity [iv] is up to 6 dl/g, molecular weight [mw in Daltons] is up to 700K). 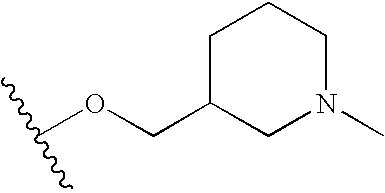 Resomer RG502, 50:50 Poly(D, L-lactide-co-glycolide), Boehringer Ingelheim Corp. Lot #R02M002(iv is 0.16 to 0.24 dl/g). Resomer RG502S, 50:50 Poly(D,L-lactide-co-glycolide), Boehringer Ingelheim Corp. Lot #Res-0354 (iv is 0.16 to 0.24 dl/g). 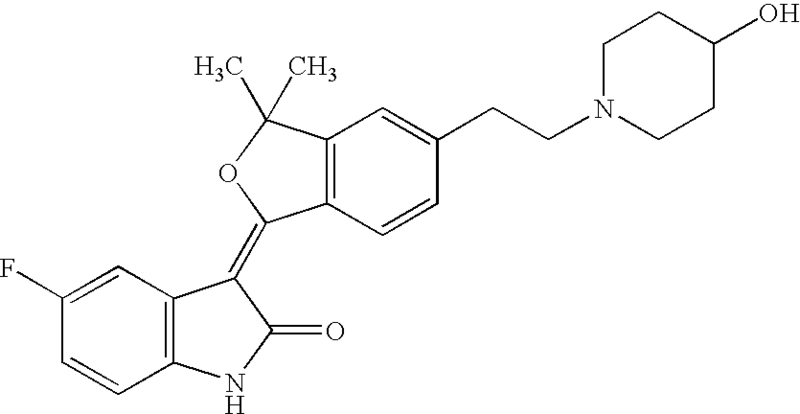 Resomer RG504, 50:50 Poly(D,L-lactide-co-glycolide), Boehringer Ingelheim Corp. Lot #1009731 (iv is 0.45 to 0.60 dl/g). 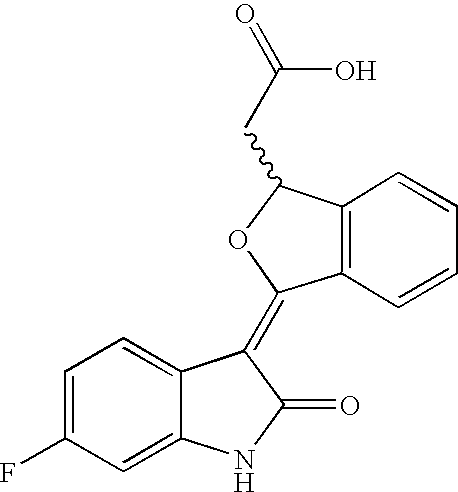 Resomer RG505, 50:50 Poly(D,L-lactide-co-glycolide), Boehringer Ingelheim Corp. Lot #223799 (iv is 0.61 to 0.74 dl/g). 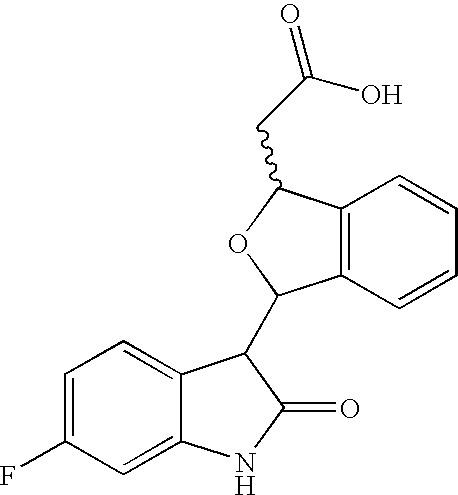 Resomer RG506, 50:50 Poly(D,L-lactide-co-glycolide), Boehringer Ingelheim Corp. Lot #34034 (iv is 0.75 to 0.95 dl/g). 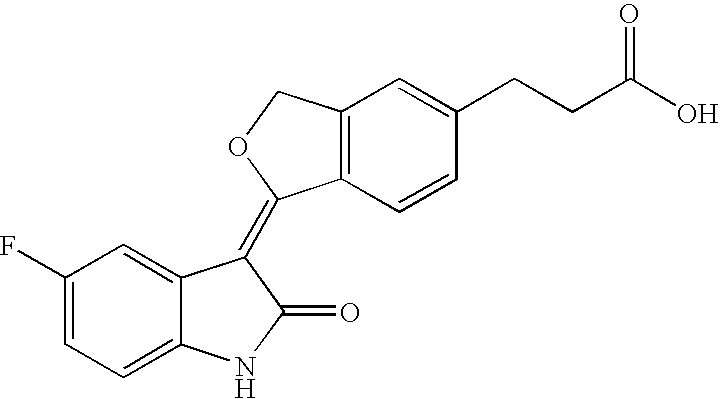 Resomer RG752, 75:25 Poly(D,L-lactide-co-glycolide), Boehringer Ingelheim Corp. Lot #R02A005 (iv is 0.16 to 0.24 dl/g). 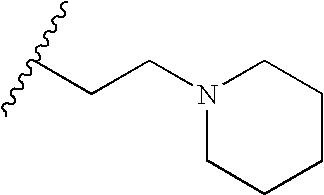 Resomer RG755, 75:25 Poly(D,L-lactide-co-glycolide), Boehringer Ingelheim Corp. Lot #1009232 (iv is 0.50 to 0.70 dl/g). 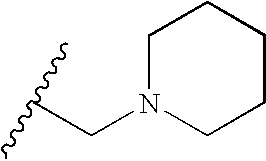 Resomer R104, Poly(D,L-lactide), Boehringer Ingelheim Corp. Lot #290588 (mw is determined by the presence in the polymer of between about 1,500 and about 2,250 of the repeating monomer unit C3H4O2). Resomer R207, Poly(D,L-lactide), Boehringer Ingelheim Corp. Lot #260911 (iv is 1.3 to 1.7 d/g). Citrate phosphate buffer (CTAB) solution used was prepared by adding 27.56 g sodium dibasic phosphate heptahydrate, 9.32 g citric acid, and 2 g (1%) cetyltrimethylammonium bromide (CTAB, JT Baker) to a 2-L volumetric flask and filling with deionized water. Phosphate buffered saline (PBS) solution used was prepared by adding two packets of PBS (Sigma catalog #P-3813) granules to a 2-L volumetric flask and adding deionized water. For stock standard preparation for compounds other than AGN206784, 5 mg was added into a 50-mL volumetric flask and acetonitrile was added to the mark. Working standards were prepared by adding 5 mL of stock standard to a 50-mL volumetric flask and adding a blend of 60:40 acetonitrile:water. For AGN206784 stock standard preparation, 5 mg of compound was added into a 50-mL volumetric flask and a solution of 80% acetonitrile and 20% water was added until full. For working standard preparation, 5 mL of stock standard was added to a 50-mL volumetric flask and a solution of 40:60 acetonitrile:water was added until full. 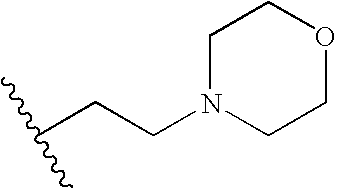 Acetonitrile (ACN) was manufactured by Burdick and Jackson. Trifluoroacetic acid (TFA) was manufactured by Burdick and Jackson. A blend of 75:24.5:0.5 ACN:water:acetic acid with 5 mM hexanesulfonic acid was used for all analyses except for AGN206748 formulations where a blend of 60:40:1 ACN:Water:TFA was used as the mobile phase. Powder blending: a Glenn Mills Inc. Turbula shaker type T2F, ID number 990720 was used. In addition, an F. Kurt Retsch GmbH& Co model MM200 ball mill was used. Powder compaction: A modified Janesville Tool and Manufacturing Inc. pneumatic drive powder compactor, model A-1024 was used. Piston Extrusion: A custom built piston extruder produced by APS Engineering Inc. was used with a Watlow 93 temperature controller and thermocouple. Weighing: A Mettler Toledo MT6 balance, S/N 1118481643 was used. Sample incubation: A Precision Inc. Reciprocal Shaking Bath with water was used. HPLC: A Waters LC module 1 plus, S/N M98LCJ242M with a Supelco HSF5 μm, 4.6×150 mm column and Waters 2487 dual wavelength absorbance detector was used. Data was analyzed using Peak Pro software, version 9.1b. The drug (TKI) was stored at room temperature with minimal light exposure, and polymers were stored at 5° C. and allowed to equilibrate to room temperature prior to use. Both materials were used as received. Formulations, listed in Table 12, were blended in a stainless steel mixing capsule with two stainless steel balls and placed in a Retsch mill at 30 cps or Turbula blender at 96 rpm for 5 to 15 minutes. Depending on the starting materials, formulations underwent four to six blending cycles at five to fifteen minutes each. Between blending cycles, a stainless steel spatula was used to dislodge material from the inside surfaces of the mixing vessel. Formulation ratios and extrusion temperatures for all formulations are listed in Table 2. A die with a 720 μm opening was attached to a stainless steel barrel. The powder compactor was set to 50 psi. The barrel was inserted into the powder compactor assembly. A stainless steel powder funnel was used to add a small amount of powder into the barrel and then the pneumatic compactor was actuated. This process was repeated until the barrel was full or no more powder remained. A piston extruder was set to temperature and allowed to equilibrate. The extrusion temperature was chosen based on drug load and polymer. The extrusion temperature was adjusted for each formulation to produce smooth, uniform looking filaments. After the extruder temperature equilibrated, the piston extrusion barrel was inserted into the extruder, and a thermocouple was inserted to measure the temperature at the surface of the barrel. After the barrel temperature equilibrated, the piston was inserted into the barrel and the piston speed was set at 0.0025 in/min. The first 2-4 inches of extrudate was discarded. Afterwards, 3-5-inch pieces were cut directly into a centrifuge tube. Samples were labeled and stored in a sealed foil pouch containing desiccant. Formulations with higher drug load required higher extrusion temperatures. Polymers with higher intrinsic viscosities required higher extrusion temperatures than polymers with lower intrinsic viscosities. Lactide-glycolide co-polymers with a higher lactide percentage (75:25) required a lower processing temperature than polymers with a lower lactide percentage (50:50). Formulation information and extrusion temperatures are listed in Table 12. Ten samples of 1 mg (+/−10%) were cut from each formulation. Each was weighted and placed individually into 50-mL volumetric flasks. For AGN206784, a 40:60 ACN:Water or 100% acetonitrile was added and samples were sonicated. Samples were analyzed according to the HPLC method used for release profile analysis, below. For the other TKIs, a 60:40 ACN:Water was added to each 50-mL volumetric flask. Flasks were sonicated and samples were tested according to the same HPLC method that is used for in-vivo release (below). Samples were weighed and packaged in vials, and each vial was sealed in a foil pouch with desiccant and labeled. All samples were sterilized with 25-40 kGy of gamma radiation. Filaments were cut into 1 mg (+/−10%) samples and packaged together in screw-top vials. Formulations were then placed in an oven at 40° C. and ambient humidity. After 14 days, samples were tested for percent TKI content. Twelve samples of 1 mg (+/−10%) were cut from each formulation. Each sample was then weighed and placed individually into 60-mL sample vials. Fifty milliliters of citrate phosphate buffer solution was added to six vials and fifty milliliters of phosphate buffered saline release media was added to six vials. All vials were placed into a shaking water bath set at 37° C. and 50 RPM. At each time point 2 mL was taken from each vial for analysis, the remaining solution was disposed of, and 50 mL of new release media was added to the vial. AGN206320, AGN206784, and AGN206316 Implants. 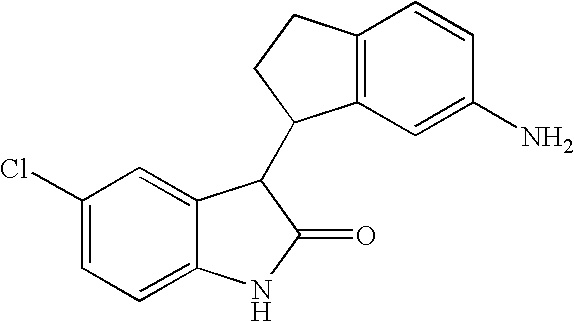 In Table 12 the API (active pharmaceutical ingredient [i.e. the TKI] value is a weight percent value. The HPLC was conditioned until stable at 1 mL per minute flow rate at 280 nm. Samples were transferred to auto sampler vials with added samples for system suitability and standardization. Total run time was 10 minutes, temperature was ambient and injection volume was 20 μL. Samples were taken on day 1, 4, 7, and at 7 day intervals after that until the studies were ended or 100% release was achieved. The total TKI present was calculated from the height of the peak at 280 nm compared to the height of the standard peak. Percent of drug released, total micrograms released, and standard deviations within formulations were calculated from the amount of drug detected. The content uniformity analysis carried showed that most formulations tested at 100% label strength plus or minus 20%. FIGS. 16 to 21 are graphs which provide examples of in vitro release data (in either pH 5.4 citrate phosphate buffer release medium or in pH 7.4 phosphate buffer saline release medium) for the five TKI used in implants with varying polymer formulations. FIGS. 16 to 21 show that TKIs with higher solubilities had the tendency to release at a faster rate than TKIs with lower solubilities. Additionally, FIGS. 16 to 21 show that TKI implant formulations with lower drug (TKI) loading released at a slower rate than those with a higher drug loading. Thus, a number of different sustained release biodegradable polymeric formulations (implants) were made for five different tyrosine kinase inhibitor compounds. The results show that the release of TKIs from PLGA polymer implants can be modified by changing polymer matrices and extrusion conditions. Notably, sustained release was achieved for all five TKI compounds in phosphate buffered saline release medium (pH 7.4) and CTAB media and the results show that TKI release from the polymer matrix can last from about one to over six months, depending on the formulation. Significantly, linear, consistent drug release profiles were obtained achieved from for each of the five TKIs in phosphate buffered saline (see formulations 7409-024, 7409-009, 7409-022, 7409-032, and 7409-071). An experiment was carried out to make microspheres incorporating one or more active agents (such as a tyrosine kinase inhibitor). A known emulsion-evaporation process for making active agent microspheres is shown in FIG. 22. 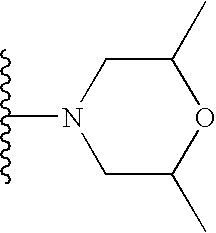 In this known process, an organic phase comprising an active agent, a polymer for encapsulating the active agent, and a solvent for both is prepared. An aqueous phase is prepared and the two phases are combined to form an emulsion. The emulsion is stirred and the solvent is evaporated. The resulting microspheres are collected, sized (sieving) and freeze dried for later use. Typically, the classical emulsion/evaporation process results in microparticles which show a burst release of an active agent from the microparticles. Additionally, the known process generally permits no more than about a 10% (by weight of the microparticle) loading of the active agent into the microparticle. We developed a new (oil in water) process for making active agent microspheres (FIG. 23). This new process for making microspheres can be used with any small molecule which is slightly soluble in water and organic solvents and which is able to preferentially crystallize in organic solvents. Such small molecules include those which have a Log P greater than or equal to four. P, the partition coefficient, is defined as the ratio of the equilibrium concentration (Ci) of a dissolved substance in a two-phase system consisting of two largely immiscible solvents, for example the ratio of noctanol (Co) to water (Cw). (1) reducing the volume of the organic phase which contains the active agent and the polymer (for example a PLA or PLGA co-polymer) which is used to encapsulate the active agent, so as to promote crystallization of the active agent. Preferably, the pH of the aqueous phase I is between about pH 6 and 8. In our process the volume of the organic phase containing the active agent and the polymer (i.e. a PLA and/or a PLGA) was reduced by about 80% to force the active agent to crystallize and/or precipitate and therefore to be embedded within the polymer. Thus, a significant difference with our new process was with regard to the concentration of the polymer (i.e. a PLGA) in the organic solvent. For example, in the known process about 450 mg of PLGA is dissolved in about 25-30 ml of methylene chloride, while with our new process, for example, about 450 mg of PLGA was dissolved in only 5 ml of the solvent, methylene chloride. Thus, we used a higher concentration of a PLGA in the methylene chloride, providing a more viscous organic phase. (2) using two aqueous phases. The first aqueous phase (aqueous phase 1) is used to assist formation a stable emulsion with the organic phase. The second aqueous phase (aqueous phase 11) serves as a sink, extracting the organic phase and assisting formation of a stable suspension for the solvent evaporation step. (3) the volume of the aqueous extraction phase (aqueous phase 11 or a water co-solvent system) is calculated based on the volume of the solvent (i.e. 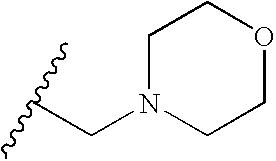 methylene chloride) used in the organic phase in order to fully dissolve it. The aqueous phase 11 is used to dissolve the solvent, to remove the organic solvent from the microspheres and to obtain hard microspheres that are stable in suspension during the evaporation step. During the evaporation process the organic solvent is removed from the aqueous phase to obtain solid microspheres. (4) permitting the active agent to crystallize. We determined that active agent crystallization can provide preferential microsphere characteristics. With our new process crystallization of the active agent proceeds in the viscous medium (mixture of organic phase, polymer and active ingredient) upon air flow evaporation or reduced pressure of the solvent. We found that the more the active agent crystallizes in this reduced volume organic phase, the more active agent there is encapsulated by the polymer. (5) establishing a pH of the aqueous extraction phase (the aqueous phase II or a water co-solvent system) such that the solubility of the active agent in the aqueous II phase is limited, that is to maximize the Log D (the water/octanol distribution coefficient). Thus, the pH of the aqueous phase II is adjusted in order to limit the solubility of the active in aqueous (Log D max). Preferably, the pH of the aqueous phase II is between about 4 and 9. (2) a higher loading (10-30 wt %) of the active agent in the microspheres. In both the known and in our new process the ratio between the volumes of organic phase solvent (i.e. methylene chloride) and aqueous phase used is about the same (between about 1:5 and 1:6). For example, in both processes for a 3 g batch the aqueous phase comprises about 1000 ml of water while the organic phase comprises about 180 ml of methylene chloride). Using our new process, each of the five different TKIs shown by FIG. 24 were separately incorporated into PLGA biodegradable microspheres. In FIG. 24 the five TKIs shown are identified as follows: first (uppermost) row: 206639 and 205558; second (middle) row: 206320 and 206316, and; bottom row: 206784. The properties of these five TKIs are set forth in Table 13, where “DSC” means differential scanning calorimetry and endotherms are noted in degrees Celsius (used to determine presence of TKI crystals). A 1.5% PVA polyvinyl alcohol) solution was prepared and adjusted to pH between 6 and 8 depending on the highest value of Log D (i.e. the Log D max) for the active agent TKI used. The pH range used ensured formation of the desired emulsion. About pH 8 and below about pH 6, the conditions are not favorable for formation of an emulsion. A separate beaker with 600 ml of distilled water was then adjusted to the exact pH of Log D max. As previously set forth, the partition coefficient (P) is defined as the ratio of the equilibrium concentrations (Ci) of a dissolved substance in a two-phase system consisting of two largely immiscible solvents; in this experiment, n-octanol and water. Po/w is the ratio of C n-octanol/C water. Thus, the partition coefficient (P) is the quotient of two concentrations and is usually given in the form of its logarithm to base ten (log P). Specifically, log P is related to the solubility of a molecule (neutral form) in organic solvents. Thus, if Lop P is greater than 4 the molecule is very soluble in organic solvent and insoluble in water. On the other hand if the active agent has a 0<Log P<1, it is soluble in water in limited quantity. Finally, if the active agent has a log P less than <0, it is highly soluble in water and insoluble in organic solvents. Depending on a compound's crystal lattice energy it can also possess low solubility in both water and organic solvents. These compounds (active agents) can also be used in this invention by adjusting the pH of aqueous phase 11 to the compounds log D max. Additionally, active agents with considerable lipohilic bulk and ionizable functional groups can possess a high log D at the appropriate pH and a high solubility at a pH where the compound is ionizable. Further, lipophilic compounds made more water soluble with flexible side chains that disrupt their crystal lattice energy or confer librational entropy to the compound in aqueous environments can also be used in this invention by optimizing the pH of aqueous phase II to maximize the log D of the compound. To 50 mg of AGN TKI in a small Erlenmeyer flask, 5 ml of methylene chloride was added. If the active is not solubilized, 5 other ml is added. Again if not enough, 5 more is added again. 450 mg of PLGA 75/25 (75% by polylactide, 25% by weight polyglycolide copolymer) was then added in the solution. After complete dissolution and even if the solution was still turbid, this phase was concentrated with an air flow on the solution in order to obtain 5 ml of a slightly viscous solution. In a small beaker with a high shear impeller, a 1.5% PVA solution was added just to cover the impeller. 2 ml of CH2Cl2 was added with a high mixing until emulsion formation to saturate the organic phase. The organic phase prepared (see above) was slowly added with stirring. Then, after a few seconds of high shear stirring, the 600 ml beaker of water (aqueous phase II) was added to the emulsion under magnetic stirring. The pH of the emulsion was adjusted by the addition of aqueous phase II (thereby forming an aqueous suspension of the newly made TKI PLGA microparticles) to bring the pH of the suspension to the pH of the log D max of the TKI used (as set forth for example in Table 13). The aqueous phase II can be water. The solution was evaporated overnight under air flow to harden the microspheres. After centrifugation and rinsing with water and before lyophilization an analysis was performed to evaluate microscopic aspect and particle size. The particles obtained were sieved on 45 μm sieve size to select part of the batch with size able to pass through a 27 G needle. Generally, the microspheres made have a size between about 30-50 microns, with a peak diameter distribution at about 40 microns. The microsphere suspension was collected in vials, freeze-dried for 14 hours and capped. In the freeze drier during the lyophization step containers were open (5 ml glass vials), at the end of the cycle the vacuum was partially replaced by nitrogen and then the containers closed directly inside the freeze drier under nitrogen and 800 mbar pressure. This experiment showed that our new method can be used to prepare active agent microspheres. A further experiment was carried out to determine the in vitro release profiles of the TKI active agent microspheres made by the process of in Example 8. It was determined that the Example 8 method permitted preparation of active agent microspheres encapsulating, for example, up to about 11 wt % of a TKI active agent. The in vitro release profiles for the TKI PLGA microspheres made in Example 9 were determined as follows. The release medium contained the following four reagents: disodium phosphate dodecahydrate (Na2HPO4 12H2O); potassium dihydrogen phosphate (KH2PO4) sodium chloride (NaCl) and; deionised water. The release medium was prepared by dissolving 2.38 g of disodium phosphate dodecahydrate, 0.19 g of potassium dihydrogen phosphate, and 8.0 g of sodium chloride in deionised water. This was then diluted to 1000 ml with the same solvent and the pH was adjusted to 7.4. 50 mg of the TKI microspheres were placed into a dialysis tube (Spectra/Por CE Dispodialyzer MWCO=50 000 Da, Ø5 mm, sample volume 1 ml, ref Spectrum 135222, or equivalent), 1.0 mL of the release medium was added and the tube was closed. Into a 50 mL centrifugation tube 50.0 mL of the release medium was added. The dialysis tube was placed in the centrifugation tube, ensuring a total immersion and the tube was tightly closed. The centrifugation tube was then placed in a shaker water bath (37° C./25 rpm). At each time point of the release, 40.0 mL of the prepared release medium was pipeted out using a volumetric pipet and replaced with 40.0 mL of fresh release medium. The sampling time points included To (time zero), 24 hours, 48 hours, 5 days, 8, 12, 16, 19, 22, and 26 days after placement into the release medium. Subsequently, high performance liquid chromatography (HPLC) comprised of a Waters® XTerra Phenyl chromatography column using a gradient composed of acetonitrile and water/glacial acetic acid (99.5/0.5) was used to determine the in vitro release prove of each of the five different TKI PLGA microspheres made. Detection was by UV absorbance at 280 nm and quantitation was based on peak areas. FIG. 25 presents the in vitro release profiles for the five TKI microspheres made. Factors relevant to the release profile of the TKI from the PLGA microspheres polymer include the solubility of the TKI in the dissolution media. In all cases, burst appears limited, the maximum burst being about 1% of the total active encapsulated. This experiment determined that TKI PLGA microspheres made using the Example 8 process can release a TKI in vitro over a period of time in excess of 28 days. a plurality of biodegradable polymer microspheres encapsulating a tyrosine kinase inhibitor (TKI), the microspheres releasing the TKI at a rate effective to sustain release of the TKI from the microspheres for at least about one week after the implant is placed in the vitreous of an eye. 2. The implant of claim 1, wherein the polymer is selected from the group consisting of polylactides, poly(lactide-co-glycolides), polycaprolactones, derivatives thereof, and mixtures thereof. 3. The implant of claim 1, wherein the microspheres release the TKI at a rate effective to sustain release of an amount of the TKI from the implant for more than one month from the time the implant is placed in the vitreous of the eye. 4. The implant of claim 1, wherein the tyrosine kinase inhibitor is provided in an amount from about 40% by weight to about 60% by weight of the implant, and the biodegradable polymer matrix comprises a poly(lactide-co-glycolide) in an amount from about 40% by weight to about 60% by weight of the implant. (g) evaporating the solvent, thereby making biodegradable active agent microspheres. 6. The process of claim 5, wherein the organic phase is a viscous fluid. 7. The process of claim 5, further comprising the step of crystallizing active agent in the organic phase. 8. The process of claim 5, further comprising the step of crystallizing active agent in the emulsion. 9. The process of claim 5, wherein the pH of the first aqueous phase is between about pH 6 and about pH 8. 10. The process of claim 5, wherein the pH of the second aqueous phase is between about pH 4 and about pH 9. (i) evaporating the solvent, thereby making biodegradable active agent microspheres. 12. Biodegradable active agent microspheres made by the process of claim 5. 13. The process of claim 11, wherein the active agent is a TKI. 14. A method of treating an ocular condition of an eye of a patient, comprising the step of placing biodegradable intraocular microspheres into the vitreous of an eye of the patient, the microspheres comprising a TKI and a biodegradable polymer, wherein the microspheres degrades at a rate effective to sustain release of an amount of the TKI from the microspheres effective to treat the ocular condition. 15. The method of claim 14, wherein the method is effective to treat a retinal ocular condition. 16. The method of claim 14, wherein the ocular condition is glaucoma. 17. The method of claim 14, wherein the ocular condition is proliferative vitreoretinopathy.